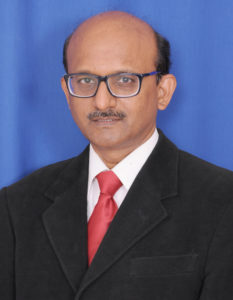 Dr. Suresh Sajjan, Principal, graduated BDS (1985) and MDS, Prosthodontics (1989) from Bapuji Dental College & Hospital, Davangere. He completed his Diploma in End User Computing (1995) & attained his MBA (2008) from Sikkim Manipal University. He is a dedicated academician and an efficient administrator. He has more than 35 national and international publications to his credit. He has attended various workshops and conferences at both national and international levels and was guest speaker for many scientific deliberations. He was awarded with Dr. G. C. Das Award, for Best Prosthodontist Speaker at the 24th IPS held in November 1996. He is an approved guide for Ph.D. studies under Dr. NTR University of Health Sciences. Life Member of Indian Society of Oral Implantologists. Associate Fellow of American Academy of Implant Dentistry.